In Greek mythology, Cupid and Psyche were star-crossed lovers whose story has inspired writers and artists through centuries. Slot developers Bally Technologies are the latest to be struck by Cupid's arrow, and have fallen in love with the pair. In Bally's version, though, Cupid becomes the chubby baby riding on a cloud with bow and arrow in hand, and Psyche looks like a Goth who's on her way to a Sisters of Mercy gig (and Bally, what's going on with her Action Man 'eagle-eyes'?). Elsewhere, as well as our chubby archer and Goth-girl, there are the statutory 9-through-Ace poker symbols, angelic harps, Cupid & Psyche logos, and the Bonus target symbol. 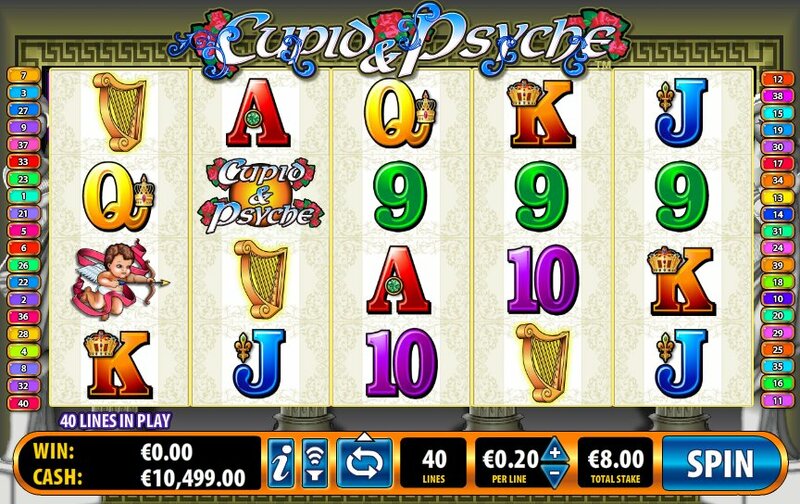 A 5 reel, 40 payline slot, if you're going to enjoy Cupid & Psyche should probably look past the underwhelming graphics and animation and look to the game's bonuses, as they're the main draw. Psyche here acts as the Wild and is Stacked. She substitutes for all symbols other than the Free Spin symbol and target symbol. 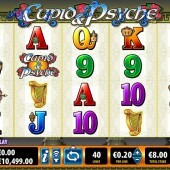 Get Psyche in a winning combo and her eyes look from side to side and the game launches into an absolute cavalcade of 3D animation, with flaming chariots, Zeus throwing thunderbolts, and Cupid firing arrows straight out of the screen. Just kidding, it's just the eyes. Yep, her eyes move. Thanks Bally. Must be a recession thing. Free games are up for grabs if you get three blue Bullseye symbols. In the Bullseye Bonus Game, 12 games can be won and you'll receive a 3x multiplier to boot. Four Bullseyes gets you 12 free games as well, but your multiplier rises to 10. Bag five Bullseyes, however, and your 12 free games get you a 25x multiplier. The free games use different reels to the base game, so at least you're spared Miss Wonky Eyes for a few goes. Look for the Red Bullseye! During the free spins, look out for the red Bullseye symbols, as they accumulate to win you even bigger prizes. Accumulate four red targets and the 5th reel will turn Wild for the rest of the free spins; accumulate 8 targets and the 4th reel turns Wild, while 12 accumulated red targets turns reel 3 Wild. Finally, 16 accumulated targets makes the 2nd reel wild. Bally may not be big on graphics or animation, but they have enough previous in the industry not to be overlooked. The free spins feature is worth the admission price alone, and if you like things simple, you'll find it here. For me, I prefer the more exotic charms of NextGen Gaming's Greek myth-themed Medusa, but the 243 ways to win splendor of Microgaming's Jason & The Golden Fleece is good for fans of mythology. At least in those two as well is that there's not an eagle-eyed Goth in sight.